The Home Master HydroPerfection Undersink Reverse Osmosis System delivers exceptional water purity while also adding beneficial minerals that produce clean, great-tasting mineral water on tap. The included permeate pump will reduce water waste by up to 80 percent while increasing water production by up to 50 percent. Home Master's innovative design eliminates the most common problems found in traditional RO systems -- canister filter housing leaks, slow flow rate, high water waste, service challenges, and slightly acidic water. What makes Home Master HydroPerfection a smarter choice? Clean, great-tasting water; a modular filter design; the power of UV light; easy-to-change filters; faster flow rate; and better water efficiency. Home Master HydroPerfection uses its nine stages of filtration, purification, sterilization, and enhancement to produce exceptionally clean water. It uses its sediment, iron, catalytic carbon and reverse osmosis purification process to remove up to 98 percent of iron, hydrogen sulfide, chloramines, chlorine, chemicals, dissolved solids, metals, and other harmful contaminates from the water. Also, the type of dissolved iron commonly found in well water will destroy the reverse osmosis membrane without the IRON filter protecting it. The Home Master's superior pre-iron filter, which contains an advanced redox media KDF85, removes dissolved iron from the water. Additionally, the mixed media prefilter uses powerful catalytic carbon to remove chemicals like chloramines, herbicides and pesticides. The advanced ultraviolet light sterilization chamber is always on guard and safely destroys 99.9 percent of germs, viruses, and bacteria. This results in exceptionally pure, great tasting water. 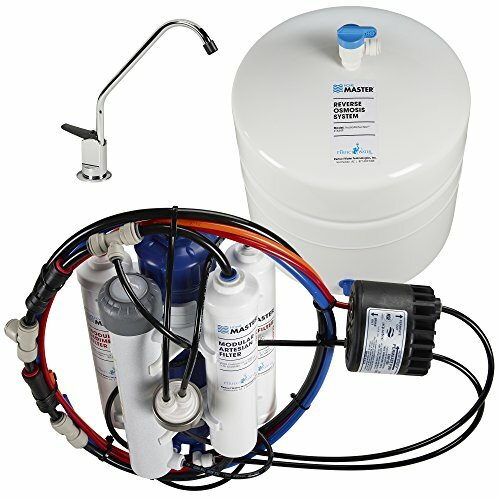 This package contains an assembled purification unit that includes RO membrane and filters, storage tank, 3/8-inch feed-water adapter with shut off, chrome RO faucet, RO adapter, 110v power supply, drain saddle, and instructions.